On this journey each day has been a story, richly packed with thoughts, reflections and prayer, all in addition to but parallel with the ordinary daily tasks of life. It is not that in “normal” life this doesn’t happen, but much remains of necessity an inner thought process, whereas here I have space to allow more of this inner life to come to consciousness. What brought me into this field of homelessness work? My own early life and formative experiences are at least a part of the reason. My parents’ divorce when I was a child: my mother’s mental health problems and suicide; and my own experiences of depression and breakdown in my 20’s, including a possibly drug related near death experience at 21 – and yes, since you ask, I was a dope smoking, hippy vagabond in those days! These were always going to put me on a different life trajectory to many of my contemporaries. I don’t talk about these things all that much, but on this pilgrimage it doesn’t make sense not to open up with the people I meet along the way, and with you, dear reader. And in talking about stuff like this I find that most people have been touched by tragedy, and that depression and mental / emotional distress is incredibly common, and that everyone has had their own share of suffering. One guy who gave me a lift lost his 2 sons in a car accident, when they were just 19 and 21. This tragedy almost sent him over the edge, but he made it through and I found his company very good and agreeable. I hope we will keep in touch, actually, as we had a great conversation about his idea for bringing derelict farm buildings and abandoned hamlets back into use. What doesn’t kill you doesn’t just make you stronger, it also makes you more interesting, and often more open to the needs of others. And so to today. 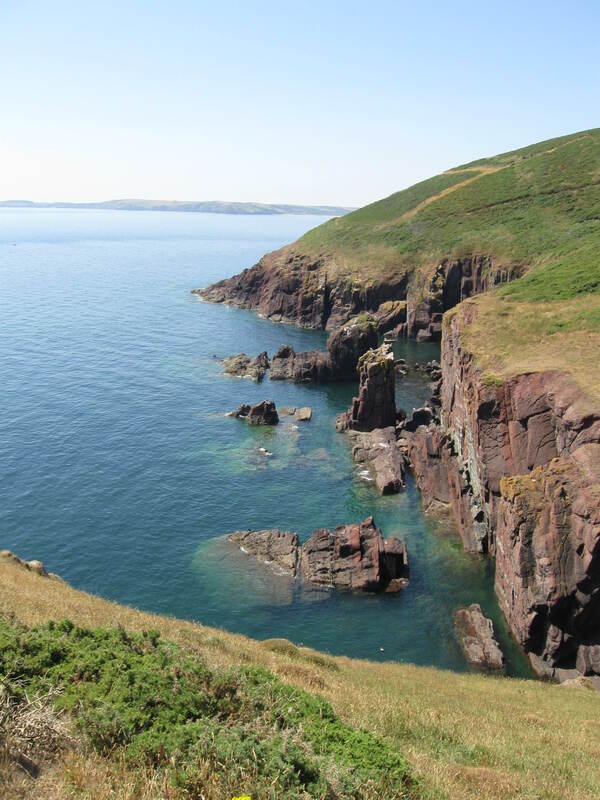 After walking the Pembroke coast path to St David’s – see photos here – I decided to take up the kind invitation to visit my pilgrim friends Betty and Dugald in Wetherby, especially as the hitching winds were so fair. The guy I mention in the previous paragraph gave me a lift from Conwy in Norh Wales to Chester, a bed for the night, and then a lift to Leeds yesterday morning. What an answer to prayer! I write this from their place. Here we are with a good cup of tea yesterday afternoon. I discovered in our conversation that Dugald has been having some struggles with severe depression too, which I didn’t even know. It was good to compare notes and just be in solidarity with each other. And I hope that some of the things I shared encouraged him. I have really enjoyed their hospitality, and the much needed rest that 24 hours of home comforts bring. Now on to the third leg of my journey, hitching from here to Melrose in the Scottish Borders to walk St Cuthbert’s Way to Holy Island. 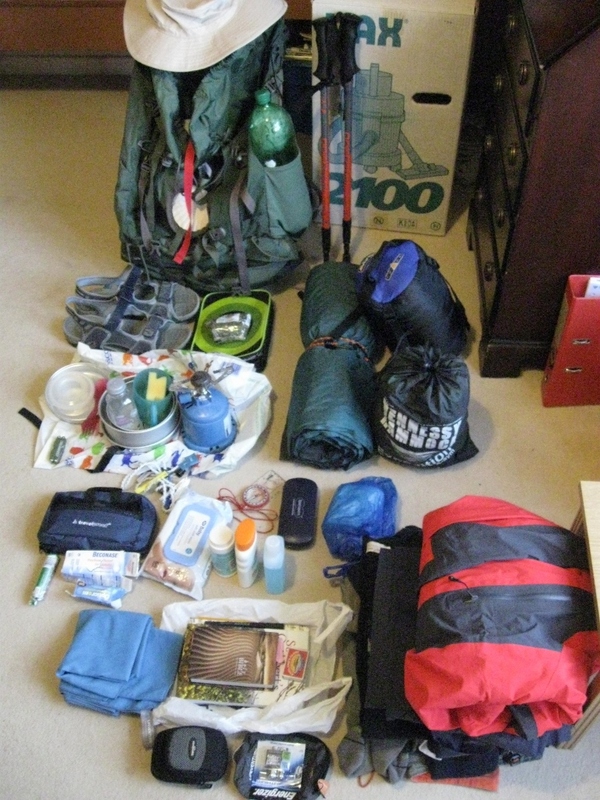 I hope to arrive by next Tuesday 30th July, and probably won’t be able to update the blog before then. Following the terrible news about the train crash in Northern Spain, on the eve of the national Holy Day, the Feast of Saint James / Saint Iago, our prayers are with all those who have been killed or injured, and all the families affected by the tragedy. First words for a few days – from the public library in Pembroke. Save our libraries! Had I been more far sighted (and well budgetted) I would have bought a small laptop or netbook before setting off. This morning I met a couple who were walking and camping with a solar charger and tablet, and obviously this is the way to go. But in fact even if I had my own laptop I was so tired last night I would have had difficulty stringing even a few words together. 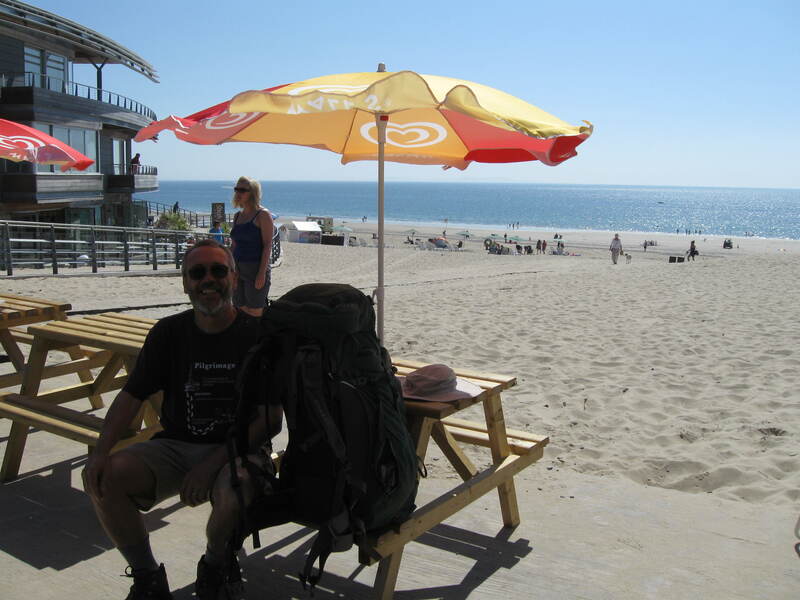 Yesterday morning I set off from Tenby along the Pembroke Coast Path. I didn’t know how far I would get. 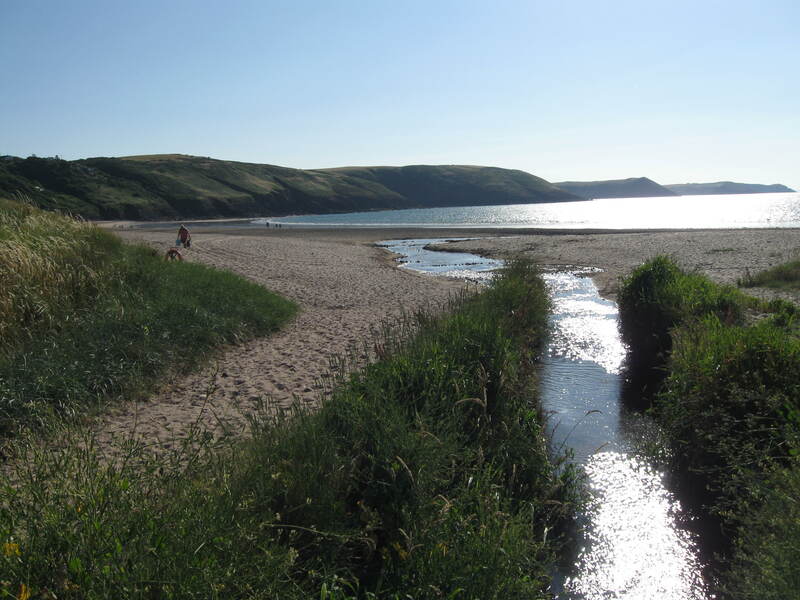 I managed 7 miles, to Freshwater East. This doesn’t seem far, but in the 30 degree heat with the weight of my pack and the ups and downs of the path, it’s not bad. And it is so very beautiful. The water is so clear. My other main mode of transport, the hitch hiking, has not gone so well as earlier in the week. My itinerary since leaving Chippenham on Tuesday morning was to hitch to Yeovil to meet Brother Vaughan, to spend 2 days with him. That part went OK.
We stayed with friends of his near Hillfields Friary on Tuesday night and then on Wednesday visited Hillfields for mid day prayers and Mass, and lunch, and then went to stay at Glasshampton Monastery / Friary near Worcester. 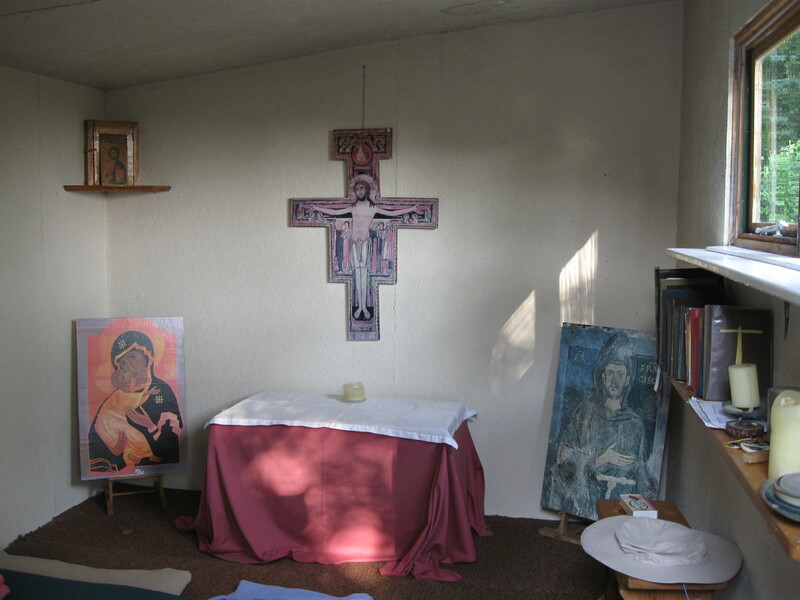 My accommodation at Glasshampton was in a private chapel built by the hermit contemplative Brother Ramon, now deceased. He lived a life of prayer and meditation, much of it as a virtual recluse, in a small shed he built at the bottom of the kitchen garden. The chapel has absorbed something of Brother Ramon’s life of prayer and quiet devotion, and I found it a holy place. Here is a picture of the altar, with on the left the famous Russian icon of the Virgin and Christ child, the Saint Damiano Cross in the centre, and on the right an icon of St. Francis. It was great to spend 2 days with Bro Vaughan, and to join with him in the Franciscan daily office, and also to meet the Brothers at Hillfields and Glasshampton. I took more photos but won’t upload all of them here. He kindly dropped me at Hay on Wye at about mid day on Thursday. From there I hitched most of the way to Tenby but got stuck at a Service Station on the M4 outside Swansea, so had to get a bus into Swansea and catch a train for the final miles. It was dark by the time I arrived at Tenby so I decided to just sleep on the beech. There were quite a few people around, and a couple of parties around camp fires, and a nearby cafe / restaurant was still serving, so I found what I hoped was a quiet spot and unfurled the sleeping bag and slept under the stars. It was only about 50 yards from this little beach cafe where I stopped yesterday morning. I also slept in the dunes last night at Freshwater East. Apart from hearing some people having a loon about after the pub both of these 2 nights have been relatively undisturbed. I guess this is something akin to life on the street, as I do feel quite vulnerable just bedding down in my sleeping bag. But I also feel that it is a privilege to bed down under the stars, and feel that these places too are holy. From Pembroke this afternoon I shall carry on along the coast path toward St David’s. More from me anon! Everyone reckons I’m bringing the hot weather with me. Whether or not it’s down to me today’s another bakingly hot day, and this morning I hitch hiked from Oxford to Chippenham. And I have to say for my first try at hitch hiking in …. years it went extremely well. I set off from Oxford at around 9.00, and got a lift in about 3 minutes. The guy who pulled over for me was James, the son-in-law of an Anglican Vicar who, it turned out, has a new role in the Oxford Diocese to help support pilgrimage – yes! – and he spotted and recognised the pilgrim scallop shell on my backpack. He also runs a restaurant in the Cowley Road that I remember passing, called Atomic Pizza, which was always packed. He was on his way to Bristol for a meeting with his new restaurant manager there. 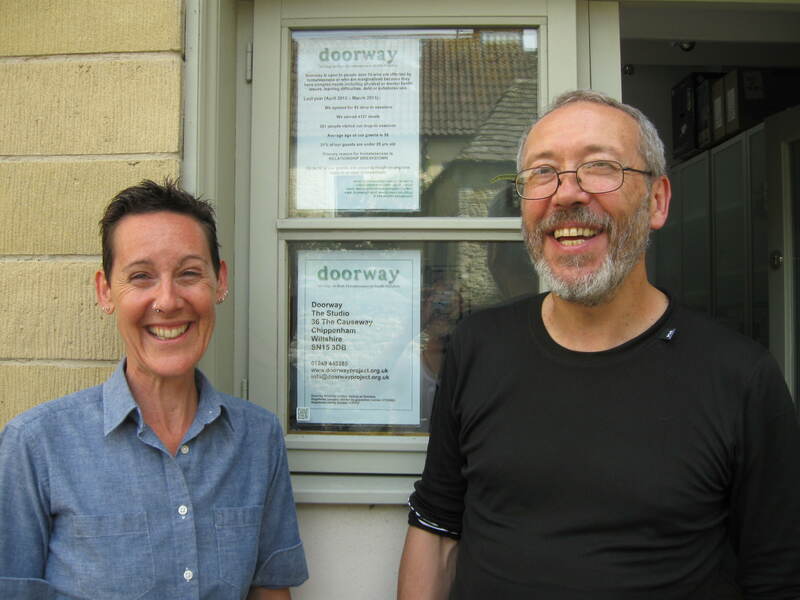 So after another lift from the M4,where I also waited all of about 5 minutes, I got to Chippenham in plenty of time for the drop in session at Doorway which I had hoped to be able to visit whilst on these travels. It was great to finally meet Lisa and her team, having been in touch with her on Twitter for almost the last 2 years. Here she is with Kev, her Support Service manager, at their office. And here is one of Lisa and me outside the office, taken by Kev. I’ve spent the day with Lisa, chatting and comparing notes on homelessness services, and have really enjoyed our conversation. At the drop in – where I should have taken some photos but forgot – I also had some really good chats with the volunteers and some of the guys using the Doorway services. Homelessness services pick up on the failings of society, and especially on the shortcomings of statutory support toward the vulnerable. And Lisa is such a good example of someone who works and campaigns on behalf of the people who other people don’t care that much about – the awkward ones, the challenging ones, the misfits, those who don’t have much in the way of family or friendship networks backing them up. As always there is so much more to say, but it’s nearly dinner time, and I’m going to have to leave it there. I can’t keep my hosts waiting! I am though keeping notes and will hopefully be able to expand and expound further on some of this stuff, before the trail goes too cold. It was so good to arrive in Oxford yesterday! I’ve never before walked over 100 miles, while more or less sleeping rough for much of the time and carrying a 15 kilo pack, so I was VERY glad to arrive at this destination. My body is very tired, of course, although it is noticeable how fit one can become in just 11 days. I walked the 10 miles or so from Abingdon, my camp of the night before, in just 3 hours, and felt I could easily have carried on. But now that I’ve actually stopped it is definitely catching up with me.. My muscles ache, and I feel all the scratches and insect bites. Remarkably so far the feet have been pretty OK, apart from blisters on my little toes and a bruise under my big toe nail. That’s probably too much information, but it is amazing how the body adapts so quickly. I’ve been resting most of the time but have been made very welcome by Soo Tian and the other residents. The Oxford Catholic Worker actually predates the London Catholic Worker, where I know most of the people, especially my friend Fr. Martin Newell who started it. For those who don’t know The Catholic Worker is a radical international christian anarchist movement founded by Dorothy Day, which seeks to put into practice the gospel of Jesus Christ in a very direct and uncompromising way. I have great admiration for their work, and am sort of affiliated with the London group, I suppose. The founding inspiration of The Simon Community was the Catholic Worker, and Simon volunteers and workers still seek to live out the same message of inclusive community today. 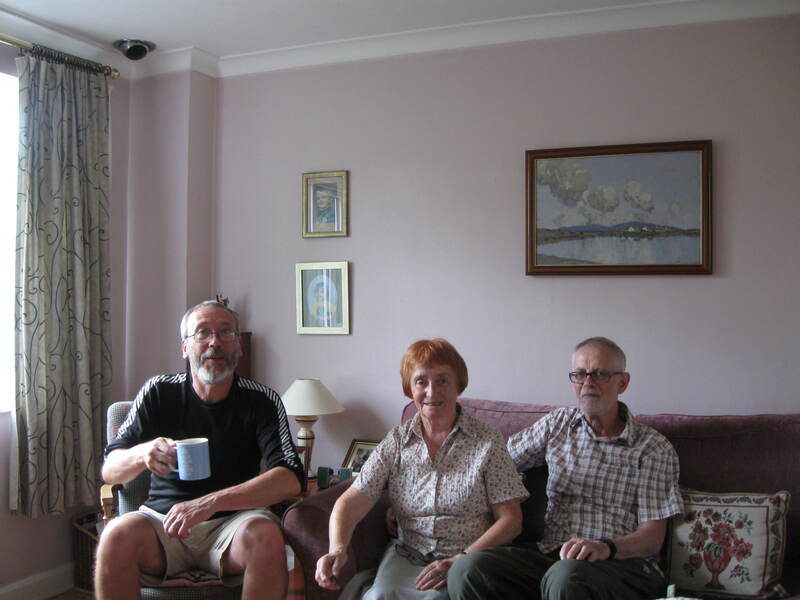 Apart from Soo Tian all the residents of St Francis House are people who came to the UK for sanctuary, but whose claims were rejected without a full and adequate assessment. Tens of thousands of people are in this “no recourse to public funds” category, a phrase used a lot in this context, and which is actually a terrible short hand for destitute, without any rights, in between states – a truly horrible bureaucratic limbo. One young guy I’ve been chatting to has at last been recognized as having a genuinely founded fear of persecution in his native Afghanistan, and after 11 years (words fail..) he has recently been accepted as a refugee. I’ve been weighing it up carefully and have decided – I think – against going to sleep on the streets. It feels too much like being a homeless “tourist” or sensation seeker. And I know I have a bank account and home and life to plug back into when I am done. During times in these travels I will inevitably rough it, perhaps even bed down on a cardboard box or 2. I’ve already been sleeping in the woods more than half the time, after all. I wonder what other people think about this? I will probably blog a bit more before setting out on the next phase of the journey on Monday. That’s all for now folks! A brief update from my friend Don’s place in Maidenhead. His hospitality has been so welcome, especially after 2 nights of wild camping and an average walk of 12 miles a day. I arrived in Maidenhead this afternoon and he came to meet me, walked with me from the river to the pub, and then seeing how tired I was he carried my pack back to his place. There is a true brother! I’m feeling a great deal more human after a bath, a short nap, and getting some clothes washed. One reason the walking is hard is that I’m carrying a fair bit of weight. It turns out that my pack is 15 kilos! I’ve checked it thoroughly and can’t see anything that isn’t essential. Unless you can spot anything in the photo.. Camping out the woods near Chertsey on Tuesday and Old Windsor last night was interesting. I found myself involuntarily looking around in case anyone saw my heading into the woods. And I even had paranoid thoughts about the farmer coming with his gun, and the like. I felt furtive. Especially walking along the very well to do banks of the Thames. I’m sure this is a theme to which I’ll return, but another day. Here’s what I’m sleeping in – a Hennessy Hammock. And very good it is too!